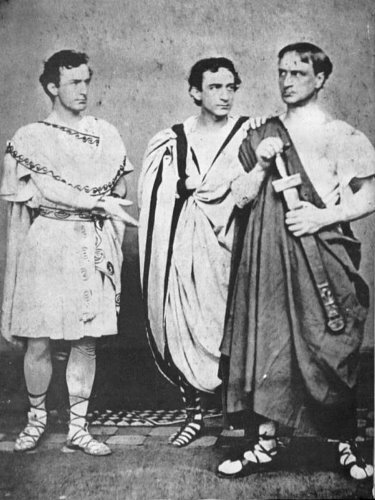 Descendants of renowned Shakespearean actor Edwin Booth want to exhume his body so that his DNA can be compared to the DNA from the remains of the man who died in the Garrett farm barn after being shot by federal troops chasing the assassins of President Abraham Lincoln. Why, you ask? To confirm that John Wilkes Booth is buried in John Wilkes Booth’s grave. We know the man who died in a barn as John Wilkes Booth, presidential assassin, Edwin’s brother and a far less successful actor, but a conspiracy theory posits that John Wilkes Booth never died in the barn, that the man buried in Wilkes’ grave was someone else entirely who was just bringing Booth his papers only to get killed by federales in the Garrett barn. Wilkes, this theory has it, escaped West changing his name multiple times and ultimately dying by his own hand (he took strychnine) in Oklahoma in 1903. One of Edwin Booth’s descendants, Joanne Hulme, was told by her mother that it was a family secret that Wilkes had escaped, but the main source of the story is a book published in 1907 by lawyer Finis Bates. In The Escape and Suicide of John Wilkes Booth : or, The First True Account of Lincoln’s Assassination, Containing a Complete Confession by Booth, Bates described meeting a man named John St. Helen in Texas in 1873. Although a tobacco merchant, St. Helen was adept at reciting Shakespeare, and one time when he thought he was going to die, he confessed his secret. Later he filled in all kinds of detail, like that the leader of the conspiracy was none other than Vice President Andrew Johnson himself. Bates says in the book that he didn’t believe St. Helen’s confession at first, but there is a record of him writing to the War Department in 1900 offering to deliver Lincoln’s assassin alive if they’d pay him the $100,000 reward they posted in 1865. Since that reward had already been paid to the men who trapped Booth in the barn, the War Department declined. 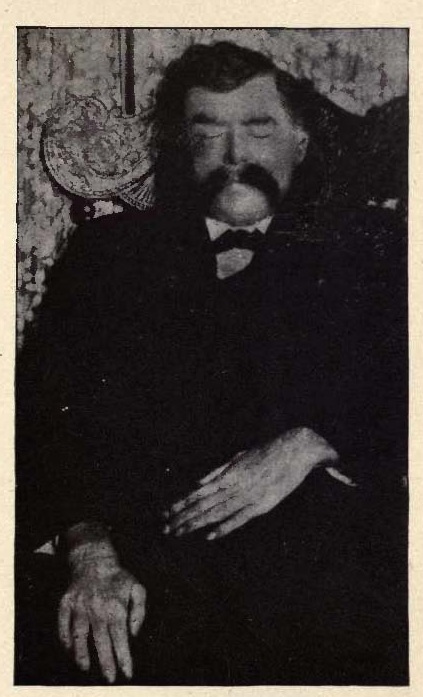 The book was roundly ridiculed when it was published, but various versions of the wrong body theory have continued to spread, including on shady History Channel “documentaries.” In 1995, another of Edwin Booth’s descendants Lois Trebisacci asked to exhume Wilkes’ body to put the question to rest once and for all. In 1995, a judge in Baltimore denied her request to exhume the remains of the man believed to be John Wilkes Booth in an effort to confirm his identity, her attorney, Mark Zaid of Washington, said yesterday. He said the cemetery objected to an exhumation, even though he had secured permission from 26 living relatives. “The family was as much interested in disproving [the escape] theory as they were in proving it,” he said by phone. Since that avenue is closed off, the interested parties now want to go about it in a roundabout way: by exhuming Edwin Booth’s body and comparing the DNA to bone fragments from the barn assassin preserved at the National Museum of Health and Medicine in Washington, D.C. and the Mutter Museum in Philadelphia. The family’s attorney Mark Zaid plans to file an exhumation request for Edwin’s body, interred in Mount Auburn Cemetery in Cambridge, early this year. This entry was posted on Monday, January 10th, 2011 at 11:58 PM	and is filed under Modern(ish). You can follow any responses to this entry through the RSS 2.0 feed. You can skip to the end and leave a response. Pinging is currently not allowed. Interesting, though I spent more time reading about the mummy than anything else. I wonder what happened to it, after the article you linked to (1937)? Wikipedia mentions the thing but not its fate. Still, now I think of a story idea, the reanimated mummy of John Wilkes Booth flees across the United States, pursued by Lincoln’s vengeful ghost… A journey of self discovery and the living dead! It would be a guaranteed best-seller. Very much on trend right now. That would be amazing if Booth was not in that grave. He was a good looking man, no doubt. I am only one of a large group of relatives that want to know the answer. Frankly, I would like to exhume then all, and bring them to the family cemetary in Penna. My great aunt, Cora Mitchell Booth, her husband, Joseph Adrian Booth and their toddler Edwin Thomas are buried there as well as my great, great, great, great grandfather, Richard Booth. He was father to Junius Brutus Booth, Sydney Algernon Booth and my great, great, great grandmother, Jane Booth.The “historians” think we are “too distant” relatives, but they all write books making a living off of our relatives on some story that was told 145 years ago, which they need you to believe for $$$$$$$$$$$$$$$$$$. This is a stressful issue for my family and it is time that history is recorded correct, and not as written by people with a vested interest.We have nothing to loose, they have everything to lose. Bring him up, I would like to know that there is not a stranger in JWB’s grave, and he does not have 3 babies buried with him, his brother, Frederick being 12 years old at his death!There was and is more than one conspiracy ! I’d like to know for sure who is buried in what graves myself, and I’m just a regular curious person. Here’s hoping the courts grant your family standing. Best of luck to you. The legal system in the US, like all non-dictatorial legal systems I’m familiar with, has certain standards. Among them is the question of standing, whether a party has the legal grounds to pursue a case. When there are many descendants who hold differing opinions on whether their shared ancestor should be exhumed, which family member has the right to chose the fate of the body? It’s not a simple question that can be addressed with appeals to vague concepts of truth and justice. The law is more specific than that. I was wondering if you could help me to ID a tintype that I have. It is a picture of a middle-aged woman. On the back of the tintype, it says “sister to Cora Logan, wife of Mr. Booth. First cousin to John W.
Does any of this sound familiar? I found this tintype in an antique shop. Any help would be greatly appreciated. I’ve recently done some reading on Edwin and John Wilkes Booth. I wonder what John Wilkes Booth would have thought of the world one hundred years later, in the year of 1965 and what he would think of the world today? I’ve recently done some reading on Edwin and John Wilkes Booth. I wonder what Edwin and John Wilkes Booth would think of the world one hundred years later in the year of 1965 and what the world is like today! I’d like to find a copy of the book “This one mad act” by Izola Forrester,written in 1937. Please let me know if the above book is worth reading. The answer is, very simply, no. In the wake of JFK’s assassination Americans have become far more suspicious of their history than ever before, and tend to look under any available rock for something to get their knickers in a twist over. Modern Americans seriously underestimate how traumatic the assassination of an American president was in 1865, especially so soon after the end of the Civil War. The government, to put it very, very simply, would never have allowed John Wilkes Booth to escape. His body was identified by David Herold, John Frederick May, and Lucy Hale, and when it was returned to the Booth family in 1869 Joseph, Rosalie, and his mother Mary Ann all gave a positive identification. While I don’t exactly see what harm exhuming Edwin could do at this point in time, I do feel that it is completely unnecessary. There are numerous locks of hair taken from the body floating all across the country, all one would have to do is compare the mitochondrial DNA found in the hair to that found in a modern Booth descendant. I have no doubt that in the end, history will have been vindicated, and all parties involved (along with Finis L. Bates, wherever he is) will be left with very red faces indeed. soldier shot a figure in the burning barn, later claiming he was told by God to do it. Ms. Hulme: My maternal grandmother, Lillian (Williams) Farrell (1895 – 1989) of Philadelphia was the great-granddaughter of Jane Booth, and repeated the “family secret” to me when I was a boy in the 1960s. She said she was told by relatives that John Wilkes Booth sent a letter from South America many years after his reported death in 1865. She never saw the letter, but only heard about it. I’ve always wondered myself, though I remain convinced of the official version, if only because lying about it back in those days would have meant the death penalty. How fascinating. Have you or anyone else in the family made a written record of your grandmother’s stories? It’s an important oral history, and even though it would have to be second-hand since she’s gone, I think it would be an extremely worthwhile project. Perhaps the mystery could be solved by exhuming the body of “David George” in Oklahoma who claimed to be “John St. Helen” in Texas who claimed to be John Wilkes Booth. Then those results could tell us. Anyone interested in JWB should read “This One Mad Act”. I first read it through an interlibrary loan and then bought a copy. Forrester makes a compelling case for JWB’s escape. All the rest fade in comparison. It is a 500 page book that lays a lot of groundwork and until you give it a close examination you are not in a position to understand what a terrific amount of work went into it. Because I tend to be a bit of a cynic I can really see that to dig up JWB’s and Edwin Booth’s graves is going to be a hard sell if for no other reason a lot of people have a lot to loose if it isn’t JWB in the grave and until this is done nothing is proved. Do you actually think we actually know the real story of JFK? David Herold did not identify the body in Garrett’s barn as Booth. In fact he said that the man in the barn is “not Booth.” He said his name was “Boyd.” This is from testimony by Lt. Doherty at the Conspiracy Trial. There wasn’t much left of the body when it was returned to family. It was more like the skeleton. They assumed it was Booth from one filling they remembered, not knowing he had had another filling since then. Booth returned to Guntown Ms, his grave marked grave is 10 min ride from the house he died in. Marker is in Duke Cem. I am also a relative of John Wilkes Booth. if he escaped or was he wrongly accused. I posted my comment on 3/15/2015 @ 14:48pm. I am a family member of John Wilkes Booth. There is so much than can be done beyond DNA. Photo comparison was used to prove Brushy Bill Roberts was not Billy The Kid; the technology could be used to compare the photos of David E George with John Wilkes Booth (although George kind of looked like James William Boyd to me). And then there’s any of Booth’s reputed descendants through Izola Forrester. If DNA proves both lines are descended from the Booth family, where there you go! There’s also supposedly a man in Virginia named John Wilkes Booth III. I’m not sure if he’s a real person, but he claims Booth was his grandfather. Why try going after Booth’s remains when there are people who claim to be Booth’s grandchildren? How different is DNA between cousins, even once or twice removed? Because the American government doesn’t want an outrage that the murderer of a president wasn’t found and executed. I honestly believe that he escaped to Guntown, MS and lived there for the remainder of his life with his cousin. That story seems very credible. And a relative did place a headstone there in 1988 because he was supposedly buried in an unmarked grave.